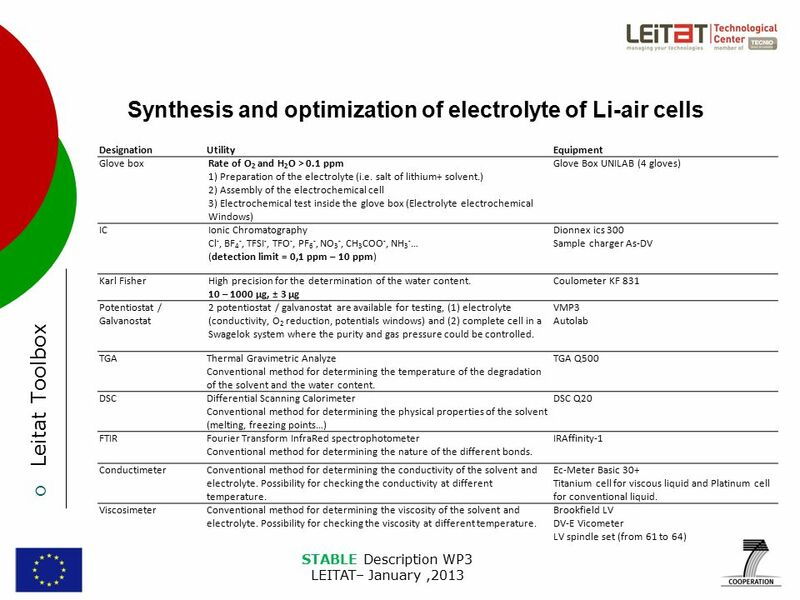 STABLE Description WP3 LEITAT– January,2013 Synthesis and optimization of electrolyte of Li-air cells David Amantia Christophe Aucher LEITAT STABLE WP3. 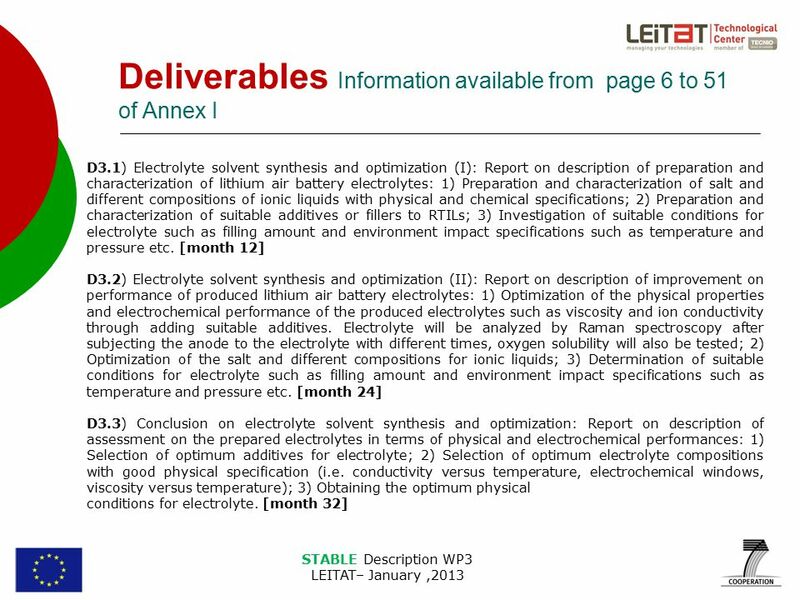 3 STABLE Description WP3 LEITAT– January,2013 Overall goals Information available from page 6 to 51 of Annex I Objectives  - Synthesis and characterization of stable electrolyte with low viscosity and high oxygen solubility to increase the discharge current density. 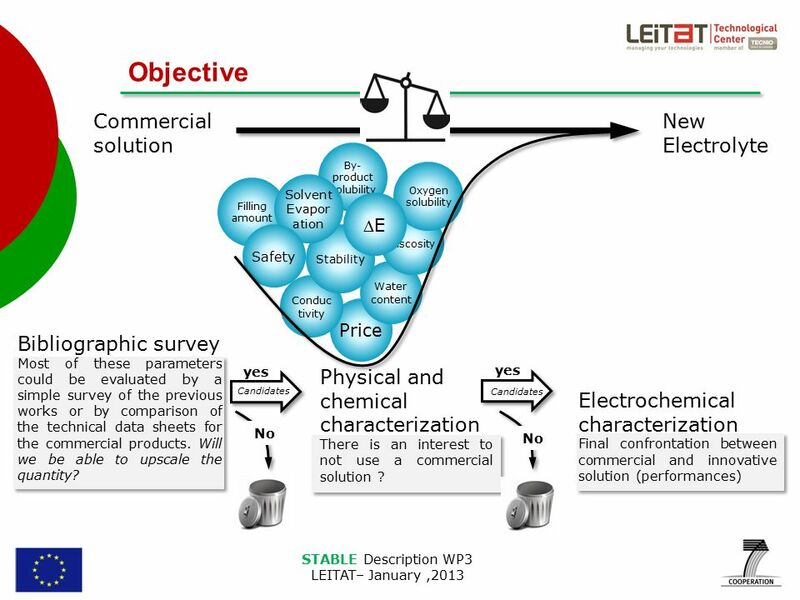  - Synthesis, characterization and evaluation of the performance of the electrolyte with different additives in terms of their effect to volatility, viscosity and conductivity of electrolyte. 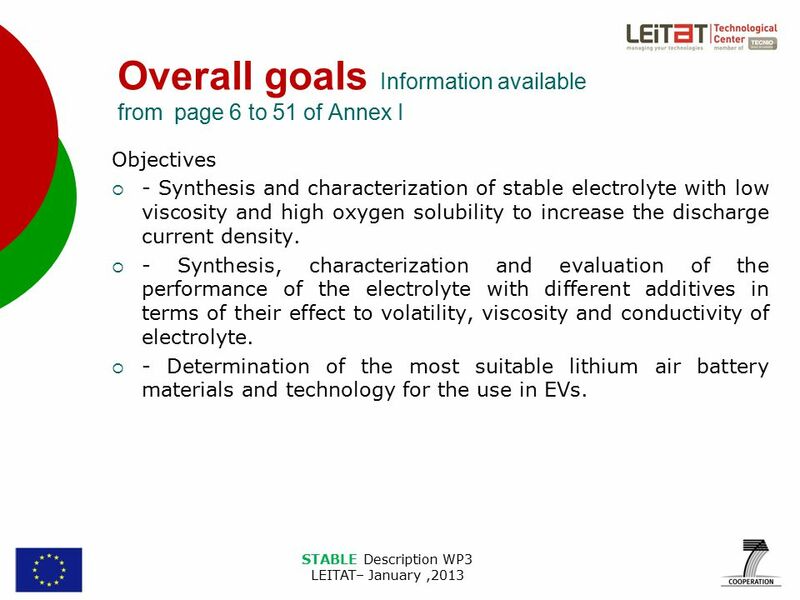  - Determination of the most suitable lithium air battery materials and technology for the use in EVs. 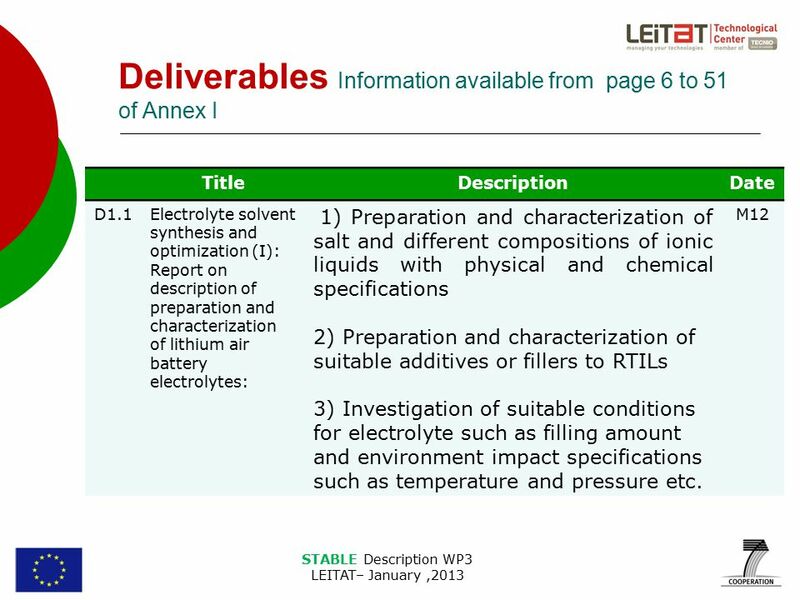 7 STABLE Description WP3 LEITAT– January,2013 Organization (proposition) Task 3.3 Task 3.2 Task 3.1 PC/DEC/EC RTILs (melts preparation) Additives 1) electrolyte 2) LISICON modification Additives RTILs (characterization) Database Repport (template proposed: (1) State of the art SoA, (2) Beyond SoA, (3) Table comparative) All technical data (numbers), Price, Safety, Other… Synthese & Physical/Chemical Characterizations Battery Samples water content, purity (ions contents), conductivity, thermal properties (volatility, degradation, Mp, Bp…), O 2 solubility, viscosity, Other… SamplesUp scaling Electrochemical windows, Capacity, EIS, rate of charge/discharge, energy & power density, Stability (cycling), By-product solubility, Filling amount, gas (nature, flow), Price, SEI, Other… Melts Preparation. 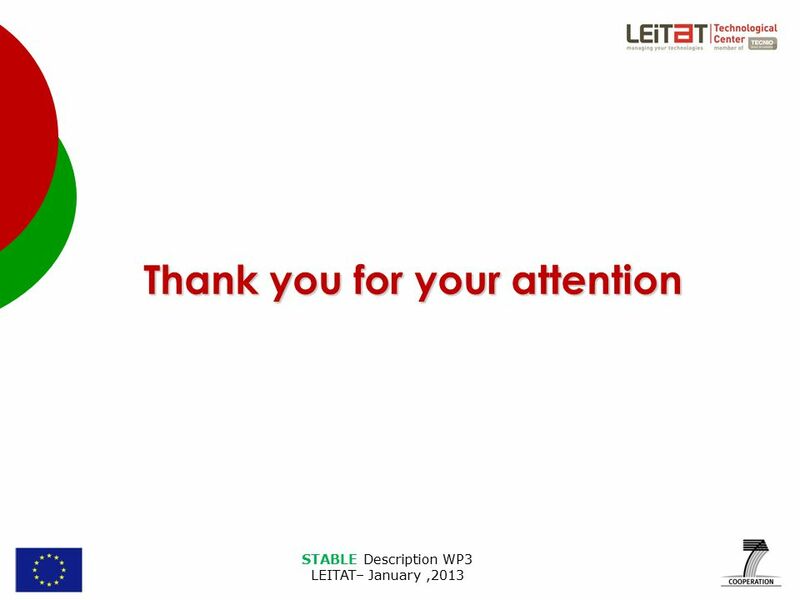 To complete a database by studying always the same parameters. Exchange between partners to lead to the complete evaluation of the samples depending of the skill/equipment availabilities. 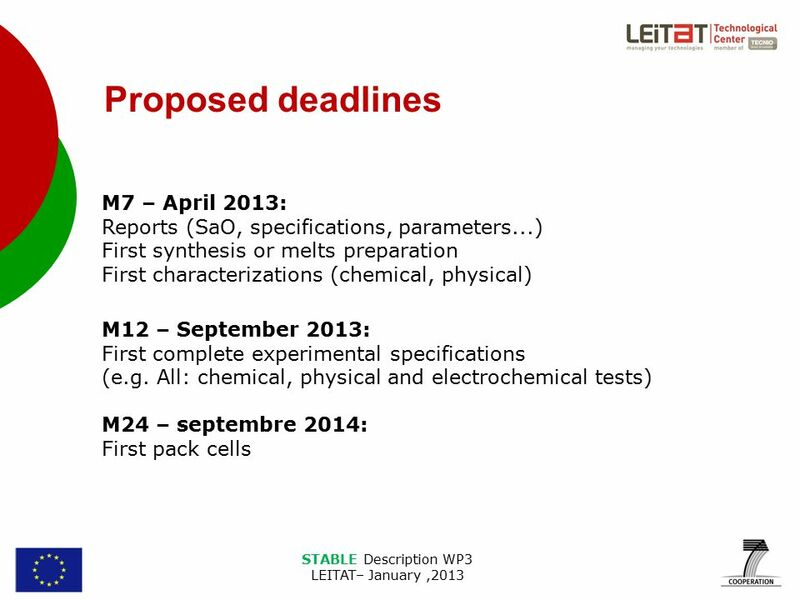 (dry/glove box, potentiostat, karl fisher, ionic chromatography, reference cell, cell pack…) Lab scale Cegasa, Polito, Leitat ? 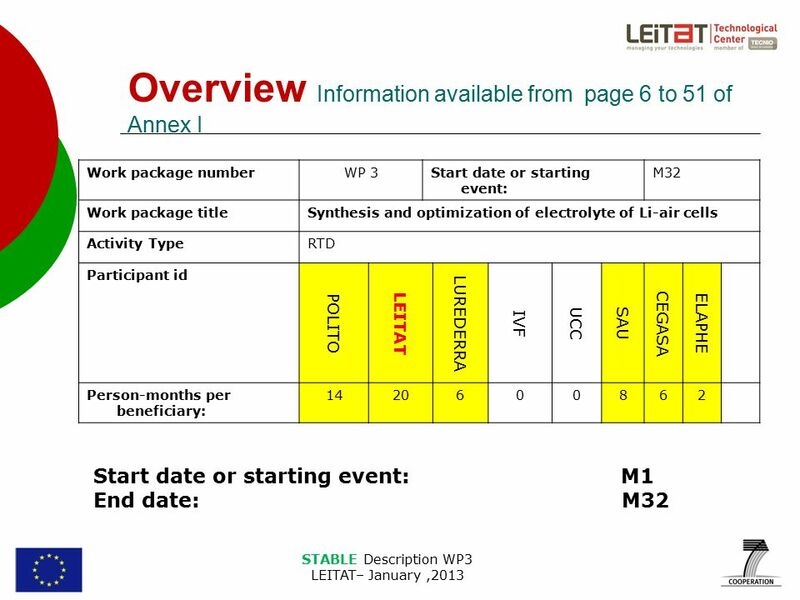 Input (Material, production, Power&Energy needs…) M24 M7 M12 M7 EV Lab scale M24 Samples transfert Feedback ? 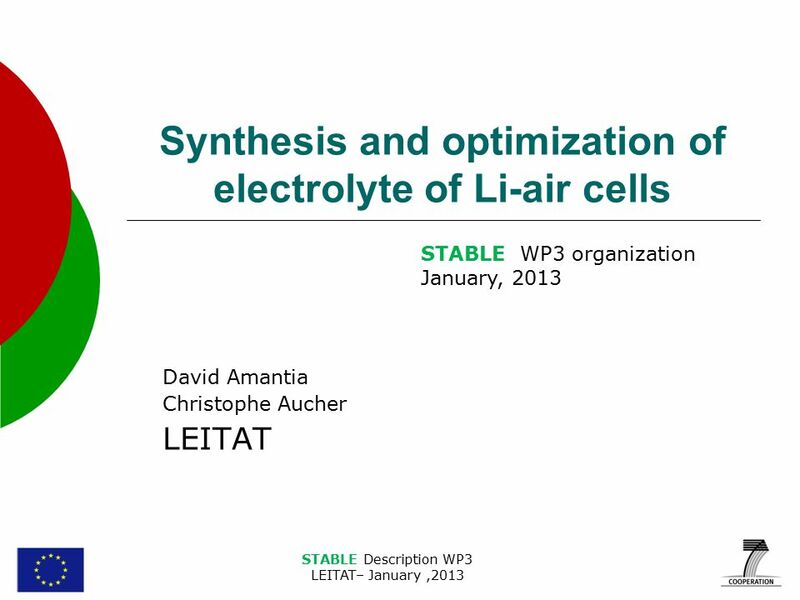 Download ppt "STABLE Description WP3 LEITAT– January,2013 Synthesis and optimization of electrolyte of Li-air cells David Amantia Christophe Aucher LEITAT STABLE WP3." S. Ramesh Development of Nanocomposite Polymer Electrolytes (NCPEs) in Electric Double Layer Capacitors (EDLCs) Application 1. 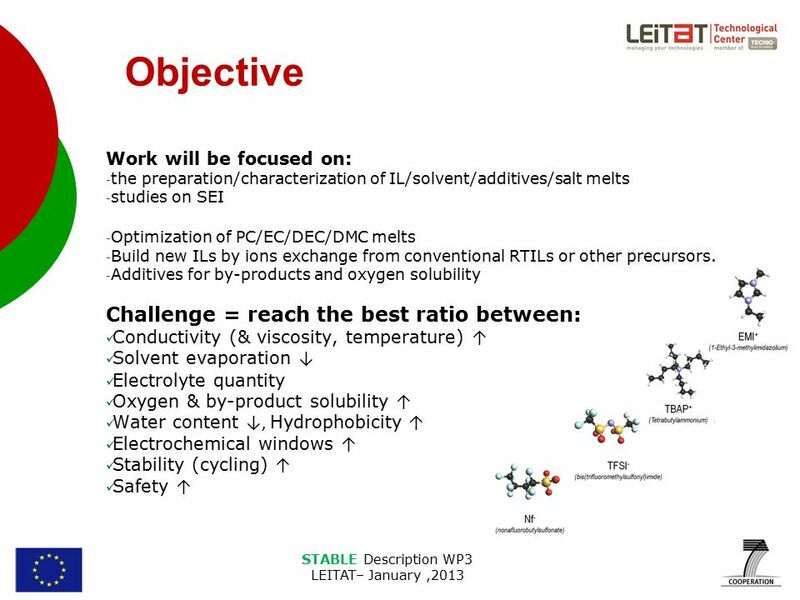 SOLUTIONS & CONCENTRATIONS WHAT IS A SOLUTION ? WHAT IS CONCENTRATION & HOW IS IT MEASURED ? 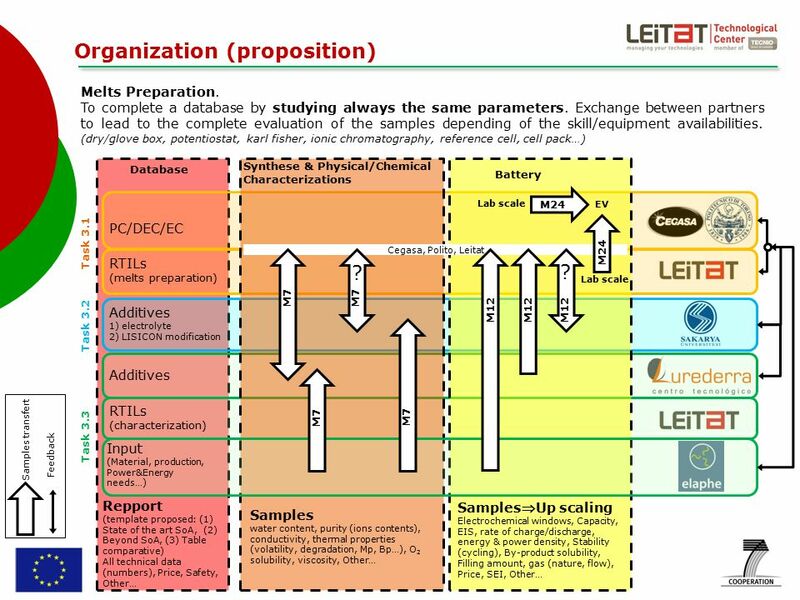 Organization of an Organic Chemistry Laboratory. Organic chemistry laboratories are mainly specified to conduct organic chemistry research studies, in. SIZING MODELS AND PERFORMANCE ANALYSIS OF WASTE HEAT RECOVERY ORGANIC RANKINE CYCLES FOR HEAVY DUTY TRUCKS (HDT) Ludovic GUILLAUME 1 & co-workers : A. Studies on Capacity Fade of Spinel based Li-Ion Batteries by P. Ramadass, A. Durairajan, Bala S. Haran, R. E. White and B. N. Popov Center for Electrochemical. M a t e r i a l s Swiss Federal Institute of Technology Zürich Nonmetallic Materials Brandon E. Bürgler Nonmetallic Inorganic Materials ETH Zürich Single. 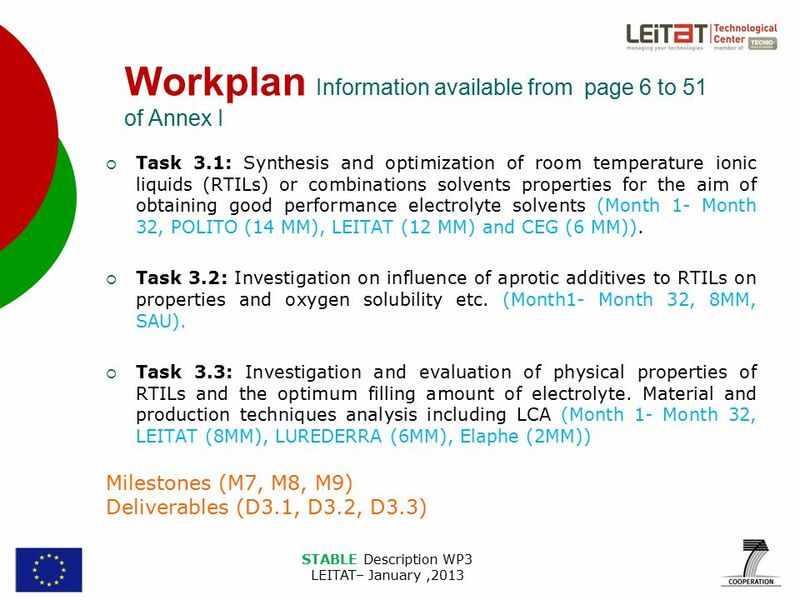 WP 3: Thermal System Strictly Confidential 1 Workpackage 3: Thermal System Project Meeting, May 11, 2006. Capacity Fade Studies of LiCoO 2 Based Li-ion Cells Cycled at Different Temperatures Bala S. Haran, P.Ramadass, Ralph E. White and Branko N. Popov Center.